After a lanyard was hung around my neck and paper yellow carnation pinned upon my lapel, I was turned loose into the verdant interiors of the North Sydney bowls club, past the kitchen and to the media circus beyond. 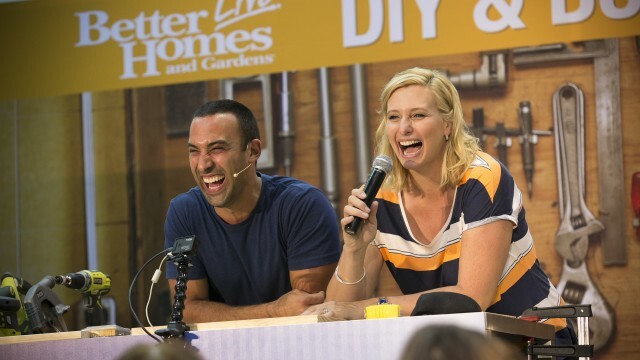 I was there to cover the launch of the Better Homes & Garden’s Live Show Sydney. Three days of white-knuckled, bare-fisted, unscripted, planned mayhem of food, freebies, how-to master-classes and above all, participation. The Woodstock of Home Improvement. An assumption driven home by a bespeckled woman (who I was to later find out was the Editor of BH&G, Julia Zaetta) who sat atop of the podium, her voice afire with passion, casting waves over the crowd, lashing your attention to the front of the room. Her magnetism only broken by a jested heckle from within the Better Homes & Gardens family. The focus of the Live Show seemed to be the experience beyond the experience, those who’d be attending the Live Show would be taking something home with them. Literally and figuratively. While the timetable was meticulously planned, as to what else would happen within the timeslot, no-one could say. It would be free-form DIY. 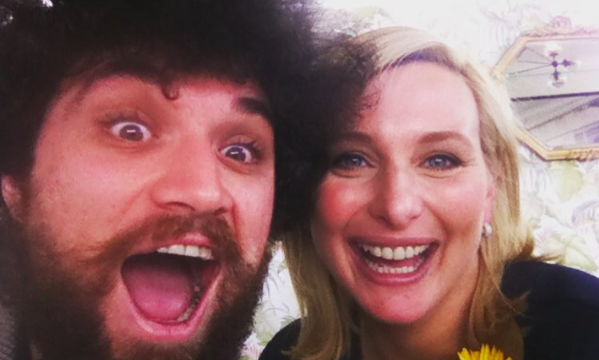 I spoke with the Better Homes & Gardens presenter, and ‘Jill of all trades’ Johanna Griggs on mass cookery, crashing a wake & being sacked by her husband. It’s obvious to see where Johanna’s passion lies, and her knowledge grows from that. Alongside her role at Better Homes & Gardens, Griggs runs a construction company with her husband and has the steady assured know-how of someone who walks the path, because she paved it. Greetings exchanged, her eyes alight, overt passion slipping over the edges of first sentence nervousness. Which was fortunate, for I was bricking it. TBS: So, what is the main thing you’ve learned from your time in construction? JG: …Not everyone has to be an expert. Generally, if you’re pretending to be an expert, you’ll get caught out at some point. TBS: So there’s no value in bluffing. JG: Personally, No. Not if you don’t know it. TBS: And you’ve never done that before? Johanna struck me as someone whose borderline OCD tendencies were equalled by her overtones of calm expertise, underpinned by her raucous laughter; someone who doesn’t take anything seriously, but takes everything seriously. Over her shoulder, I saw her BH&G cohort, Fast Ed, holding the crowd’s hand through the ABC’s of Chocolate, buff passion personified. The man sweats chocolate assuredness. JG: Respect is a big one, especially in construction. Respect for everyone in the field. You have to, at a certain point, respect what they’re telling you and allow them to do their job well. In fact, I’ve been sacked off a site by my Husband for this very reason, I felt I was right in a measurement issue and I wasn’t. TBS: What happened when he got home? JG: Well, I was able to work my way back into his good books, by refusing to cook for him. TBS: Switching over to cooking, what do feel people overlook the most? JG: If you’re going to be cooking for a lot of people, Lists. Perhaps I’m very OCD, hard to believe I know, but I’ll plan menus a couple of weeks beforehand. One: To ensure I don’t overbuy, because it’s far too easy to lose the plot, and Two: To manage the process. How am I going to use my fridge space, how I going to use my cooktop space. When does this need to be prepared etc. On the day, it looks effortless, but it depends on how much preparation goes into it. TBS: Just so I understand, why do you cook for such a large amount of people? JG: We entertain a lot. JG: Yeah! For example, it’s my Husband’s work Christmas party coming up, and we’ll have about 60 people at the farm. The same goes for everybody who works on the BH&G TV Show, every couple of years we do a big campout, hire portaloos, and we cook for them. JG: Well, the reason is, that everything in work these days, is about streamlining. No-one seems to have a life outside of it. They’re there to work. Slaves to the keyboard, or tools or whathaveyou. Sometimes it desensitises what’s going on in their lives, so that’s why we do it. To have a weekend like that, to let people who work with each other, know the people they are home. It’s a nice way to give back. TBS: Does that push to other areas? JG: Yeah, we do all the catering for our major family functions, but when you find cooking a passion, and not a chore, its great. The way I relax, is to make the people around me relaxed. That’s what it’s all about, really, food is meant to be enjoyed. You know, let your hair down, let your kids run around, have a drink if you want to, or whatever that may be. TBS: Have you always held that important? JG: Well, growing up, our house was always full of people, we have a large family, and a massive extended family, so we were always at family functions. One of my earliest memories, it’s a horrible story, but was at a wake that went for three days. As kids we roamed around this hotel, watching our parents dance on tables, it reached a point where it was about celebrating that person’s life. Because my parents were so generous, we’d pick up billets, the Alaskan swim team or the Hitch-hiker my Dad picked up in Far North Queensland who lived with us for four years. We were the go-to people when you couldn’t find anything else. I never ever saw my parents not feed someone, or not invite them into our home, so that’s where that came from. I don’t want to think that someone doesn’t have somewhere to go on Christmas. We have big, loud rowdy Christmases, but if somebody wants to be part of it, I’d rather them do that as opposed to sitting in a room wondering otherwise. And the end of it, what I treasure is cleaning up at the end of night. I love walking around picking up pieces of conversations, where everyone is laughing, or giggling or debating in the corner, and I go to bed, knowing the night was a good one.